Tennis training must incorporate strength and conditioning on a regular basis in order to develop aerobic and anaerobic capacity, strength and explosive power, speed and quickness and also flexibility. Following the right fitness training is a must that every player should do. Fit4Tennis will give you the opportunity to work on your fitness by following a specific strength and conditioning program for tennis. 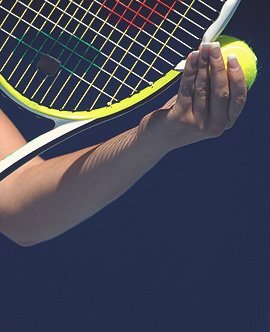 By following your fitness program step by step and by being consistent you will see results in a few weeks and this will help you to improve your tennis game. With any program that you order you will receive at least one strength training workout, two agility workouts, a core strength workout, two cardio training workouts and one stretching routine. Tennis is a sport with increasing competition and therefore, increasing physical demands. 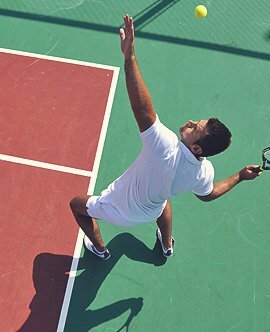 Being fit to play tennis or simply being in good shape is now mandatory in order to compete at higher levels of tennis. Fitness and Tennis cannot be disassociated anymore. Most tennis players know how to hit ground strokes, but the player with more strength, power, quickness, stamina and flexibility will be the most successful. 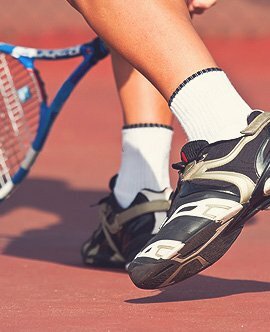 Strength and Conditioning for Tennis has become a daily routine for most tennis players. With Fit4Tennis I will design specific fitness training for tennis athletes. Regarding your level and needs this will give you 3 to over 6 hours of fitness workouts a week. It will include some strength training, cardiotraining, agility training, and stretching routines; everything you need to improve in order to become a better tennis player. Conditioning for tennis has become a very important part in any high performance tennis program. You will find strength and conditioning coaches in most of the better institutions because it is now well known that strength and conditioning exercises can help players to use their full fitness potential on the court. 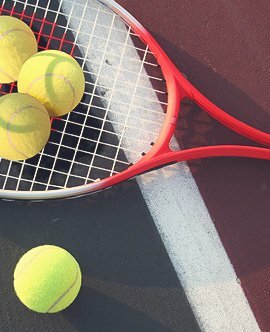 Fitness for Tennis involves the development of the different physical capacities such as strength, flexibility, endurance, agility, explosive power and speed. A complete tennis player is a player who has a good balance between those different capacities. This is why in a good and efficient training program physical training for tennis players should represent at least 30%of their overall practice time. With Fit4Tennis you will be able to get training videos that will help you improve your speed and agility on the tennis court. You will find a large selection of fitness programs that are specific for tennis players. Those programs will be individualized regarding your gender, age and fitness training experience. Once you chose the right fitness program that will fit your needs you will then be able to download it instantly and you can start right away to improve your fitness level. Not everyone has the opportunity to work with a strength and conditioning coach or with a fitness trainer. With Fit4Tennis you can have an individualized fitness program designed to help you improve your overall fitness level. If you are not fortunate enough to have a personal fitness coach, Fit4Tennis is the best substitute. If you want to become a great tennis player, Fitness Training is mandatory. Fit4Tennis offers you an easy solution to achieve your goals! Fit4Tennis programs are easy to follow and more affordable than a personal fitness coach. Once you receive your order you can follow professionally designed workouts a few hours a week simply by reading the instructions in your program. Fit4Tennis will give you a specific tennis program including strength training, agility and quickness training, aerobic and anaerobic training and flexibility training. You will learn how to use weights for tennis. This tennis weight training program will give you specific gym workouts that will help you to become more powerful and explosive. Strength training for a tennis player is also very important to prevent injuries that could occur for people who play frequently and at high intensities. Depending on your level and age the weight training will consist of weights, machines, elastic band or body weight workouts. Subscribe to my newsletter to receive news articles, updates, offers and latest info to your email.